We know the Phillies have the potential to chase nearly any free agent on the market, but we've also established that's not the direction ownership expects or desires to go. General manager Matt Klentak said earlier this week at the General Manager Meetings that he's content with the positional side of the roster but acknowledged the need for added depth to the starting rotation. 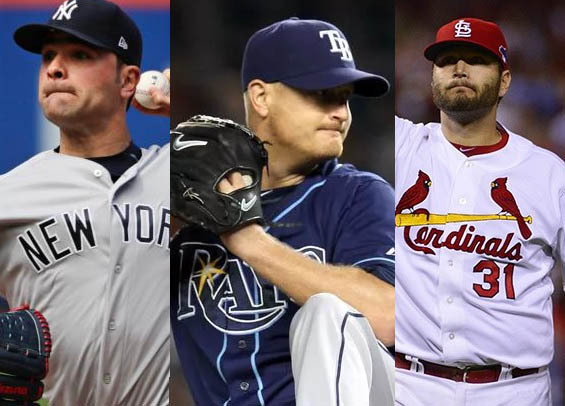 There are some quality arms in this winter's free agency class, but few that align with the Phillies current phase of a rebuild. For instance, it wouldn't make sense for Klentak to throw a four-year deal and something north of $80 million out to land a 31-year-old Jake Arrieta. Same goes for Yu Darvish. The Phillies have the cash, but it's not a smart play. At least right now. Instead, Klentak and Co. are likely to look at second and even third tier options. Your classic innings eaters to slide behind Aaron Nola. A left-hander hasn't started a game for the Phillies since late 2016, so it would make sense for the club to target one this offseason. Garcia \put together some quality seasons in St. Louis but bounced around a bit last season, spending time with the Yankees, Twins, and Braves. He pitches to contact and pitched more than 175 innings in a season just once in his nine-year career, but he's serviceable and likely can be had for less than $10 million a year. Lynn missed the entire 2016 season following Tommy John surgery but showed he's in good shape with a strong 2017 campaign. He's pitched more than 200 innings twice in his six seasons in St. Louis tossing 186 1/3 last year. The strikeout rate isn't what it once was and he surrendered 27 dingers last year but, a 1.23 WHIP means he knows how to pitch. Bad luck has hampered Cobb throughout much of his six-year career. He missed the entire 2015 season with Tommy John surgery and made only five starts in 2016. This after he missed two months in 2013 after being hit in the head by a line drive. He pitched well last year, putting together a stat line that would make for a great No. 3 in a rotation. He's not a strikeout artist - 6.4 per nine innings in 2017 - but he's crafty and has a 57-percent quality start percentage for his career.